It sounds wonderful, I will be sure to give it a try! Well isn’t that a thing of beauty! The flavor combinations are very seasonal, with what I’m guessing is a tender crumb thanks to the buttermilk. Definitely welcome on any holiday (or other) table of mine. I really like reading posts where bloggers remake something from their blog’s early days. It gives me great confidence that I can look back someday and improve on what I’m doing now. Your holiday bread is a work of art! You didn’t have to tell me twice! Alright, maybe you did because I might not have found it on my own. This bread looks wonderful. 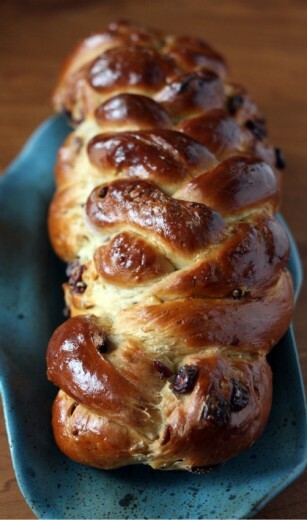 Braided breads are always so impressive to look at (really Dana. It’s beautiful.). And even better to eat. I will certainly be making this for Christmas. And I will be making two loaves. One for me to devour on my own and another for my parents. Tis the season after all. Oh, I can’t tell you how much I like your food. My boyfriend said that the goat cheese pasta with oil cured olives and tomatoes was the best thing I ever made. I agree. Regarding the bread, how long do you think it keeps once made? Three or four days outside of the freezer? Any suggestions? I am impressed with your bread. It’s a delicious looking one. It looks like a great Halah. Do you mean dry yeast? Can you tell me please what is the amount of the yeast? As living outside of U.S.A. I am not sure what you mean. Yummy – well one more thing to add to my baking list for this week. But thank you for this – it will fill out a gift basket perfectly! Dana – I made this last night, except, I didn’t quite follow the instructions – I left out the hot water when mixing (as I was doing this and cooking dinner at the same time!). Consequently it took quite a bit of time to get raising action to happen. I couldn’t figure it out until I reread the recipe and realized I missed the hot water step so I popped the bread dough into a warm oven and crossed my fingers. I took the finished loaf out of the oven at 11:30 last night and it looks amazing – not quite as good as your pictures but my hubby says it looks like I bought it. I used pistachios instead of walnuts and tonight I’m going to try it again with apricots and almonds. Thanks so much for the recipe and inspiration! PS to veredgy – I used 4 1/2 tsp of bread yeast or dry active yeast powder. I got that from America’s Test Kitchen book: 1 envelope = 2 1/4 tsp dry yeast powder. Hope that works for you. I love breads like this with orange zest, dried fruit and nuts. I can see why you make it every year! I’ve made this atleast 5 times, and usually double it so that I can give one of the two loaves away…it is amazing bread that gets gasps of “you made this!” Thank you for sharing it Dana! I made this bread for breakfast on Thanksgiving, and my husband and I loved it. I made french toast using the leftovers the following day and it blew my mind. This bread is so good, thank you for sharing – I am already planning to make it again soon! Question – have you ever let it rise overnight at a cool temperature? I’ve been experimenting with various no-knead bread recipes which give long rise times to compensate for kneading, and was thinking of trying it with this recipe. Susan, I haven’t tried that with this recipe. As I understand it, the no-knead recipes that work best are very simple in terms of ingredients and they also have very little yeast in them. I think you would end up with a balloon of dough if you tried it with this amount of yeast. I would imagine you could do a long slow rise in the refrigerator overnight, but I would also imagine that you would still need to knead the dough. I wish I could be of more help. If you try it, will you let me know?